Digital Sight & Sound: Surveillance Camera Systems – How Do I Choose? Fourteen hours, three planes, one harrowing run to make the final connection and two boat rides later you have finally made it to the “deserted island” of your dreams. And just as you crack the spine of the book you have been meaning to read for months, ok maybe for years, your phone rings. As you curse the fact that this “deserted island” has remarkably good cell phone service, you see that your alarm company is calling you. They alert you to the fact that your back door has been opened and two motion detectors have been activated. The police are on the way! You ask them to hold for a moment and click over to the camera app on your phone, while extolling the remarkably impressive internet signal on this “deserted island”, and you see that it is the 12-year old neighbor, who has come over to water the plants and is fumbling with the alarm keypad. You log in remotely to the alarm and disarm it, then click back to the alarm company phone call and instruct them to cancel the police. You put the phone down, and you can enjoy your vacation without worrying about your home. The cameras have provided you with “remote situational awareness”. When selecting a camera system, it is imperative to understand what the primary purpose is and to stay focused on that purpose. I ask our clients to pick one of these three primary functions so that we can recommend the best mission specific product. The first is situational awareness. You increase your capacity by being in two places at once. 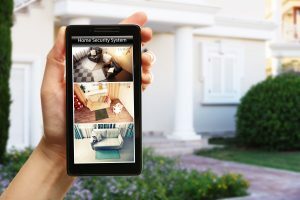 You are inside your home office and you want to know what the kids are doing in the driveway or in the pool – allowing you to monitor the safety of your children outside while working on something inside. The second is general incident recall. We just want to see an overview of an area so that we can view trends for safety or protective purposes. For example, you may want a camera in the horse stall at the stables, so that you can see how frequently your horse is fed, groomed or exercised. The third is forensic recall. This mission requires a higher resolution camera and product placement becomes critically important. Views from second story soffit mounted cameras will not produce images of someone’s face that are recognizable. The cameras must be positioned lower, with more direct target image framing. If there are rumors of kids damaging cars in driveways, and you want to be certain that you can identify the perpetrator, it will require a forensic recall mission product and placement. Product selection and camera placement are very different for each mission. Find a professional you like and work with them to identify the primary purpose of your surveillance system. Professionals like Digital Sight & Sound have real-life experience with surveillance systems. It is worth the time and investment to have the professional assistance to get it right the first time.